Previously we had made a multi-profile badge which you can find here. Now comes the version two of this badge. Which is nothing but the same badge with a cover background. Honestly it's just a rip off of LinkedIn profile badges. But since they are limited to LinkedIn, you can use this profile badge to meet your need. Since this is basically a modified version of the previous profile badge we are going to reuse the same code. Step 1. 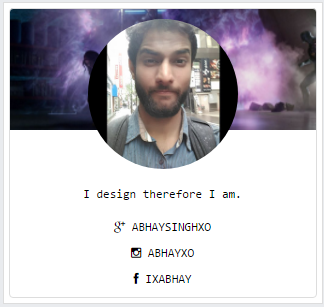 Define the CSS for circular image, then a CSS for list of links, and then the badge border and a background cover which is nothing but a background image positioned properly. Step 2. 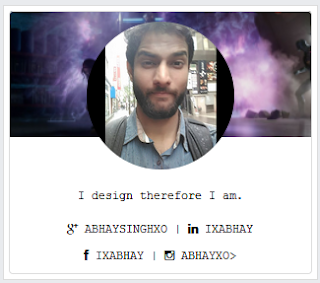 This badge uses font awesome, include following link to font awesome css. If you are not sure how to use font awesome further, go here. What I did was just included the icon and link in the same link row. And in case you are wondering what is that image I am using as cover. It's Blink from X-men Days of Future Past fighting the Sentinels. I'm using a smaller version of this image, just to reduce the load on my visitors. Let me know your thoughts.